Left: Our ski route (clockwise) on the Sellaronda route. 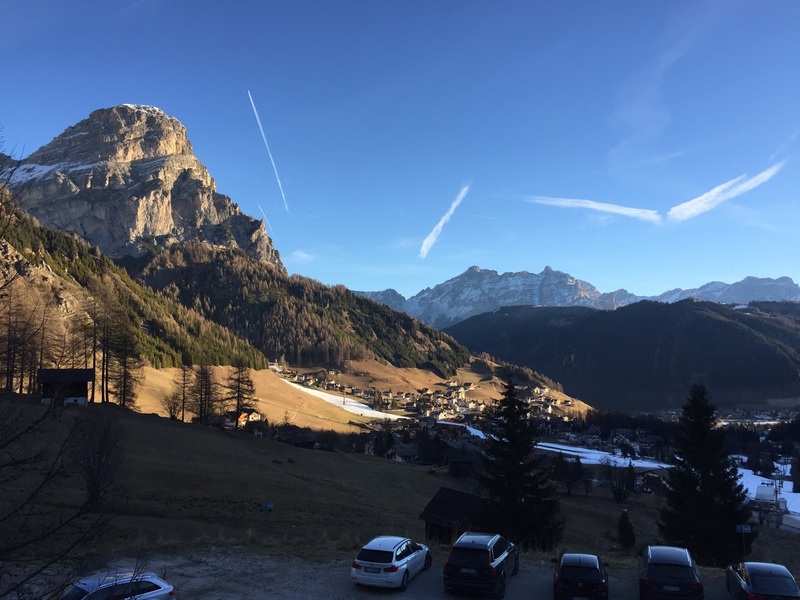 Right: Passo Sella, Canazei ski slopes with Punta Grohman (Grohmannspitze) in the background. Here we are again back in Colfosco. The last time we were here was in June 2008. Back then, we stayed at Garni Delta (see Colfosco Bed and Breakfast Hotel - Nature Hotel Delta). Today, the name is slightly different, Nature Hotel Delta, but it’s the same great place! As fate would have it, we stayed in the same exact room that we did 8 years ago. In 2008, it was our first time in the area and we spent our time hiking (see Alta Badia – Some Dolomite Hikes). This time around, we were here for the skiing. This weekend was a 4-day holiday, Thursday – Sunday, called the “ponte dell’immacolata”. In English, we call it the Feast of the Immaculate Conception, which falls on December 8th. Friday is not a holiday, but many people take it off as well. We drove from Bergamo to Colfosco. It took under 4 hours going, but 6+ hours returning due to traffic on Sunday on the A22. The A22 is called the Autostrada del Brennero and connects Modena in the south with Brennero in the north, on the border with Austria. At this time of the year, there are the “mercatini di natale” or Christmas markets. 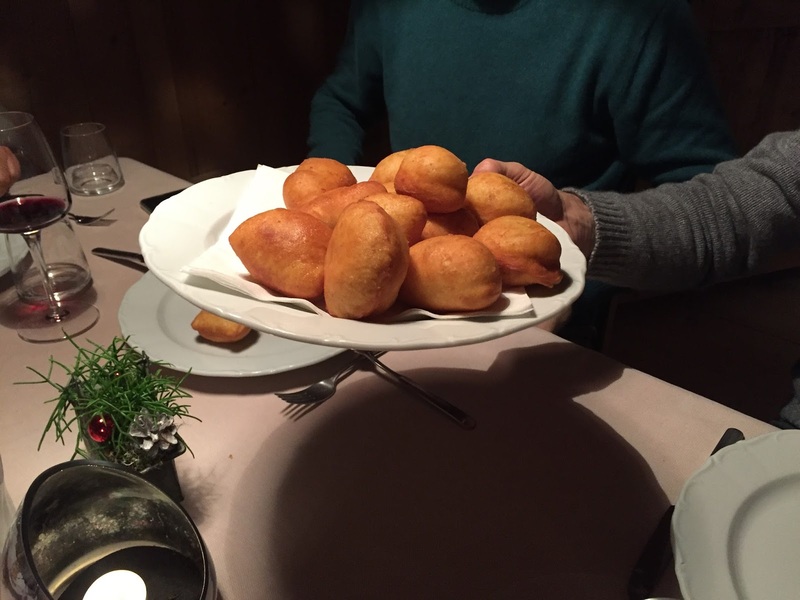 In particular, the Tyrolese Christmas Markets in Trentino-Alto Adige are quite famous. Apparently, the more north you go, the more German it gets, and the Christmas markets get more “authentic”. So, it seemed everyone and their uncles and aunts piled into buses and headed north for the long weekend. Oh well, the subsequent traffic we encountered couldn’t erase the beautiful weekend. We should have left Colfosco earlier on Sunday but decided to take a short hike in the morning. 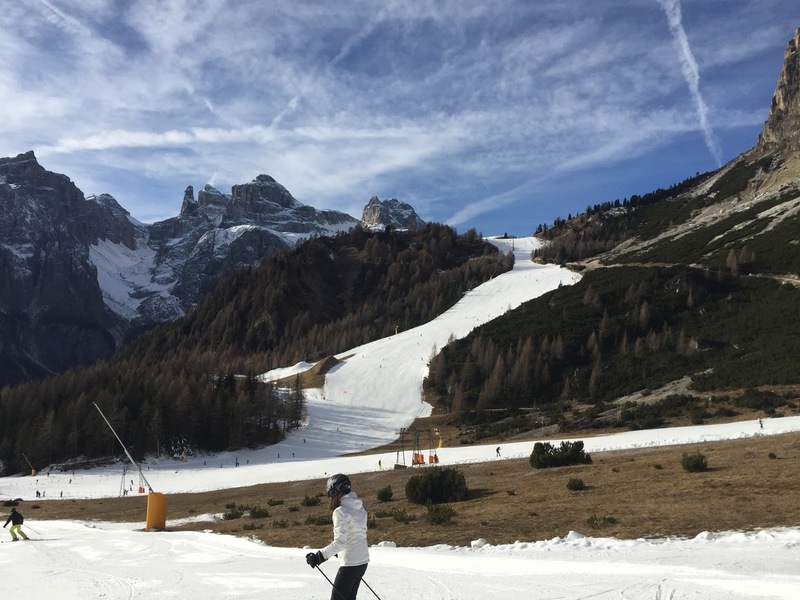 This time around in Colfosco we were part of a group of 7, and the goal was focused on skiing. The first day, we skied above Colfosco and the area between San Cassiano and Corvara, that is part of what is called Alta Badia. 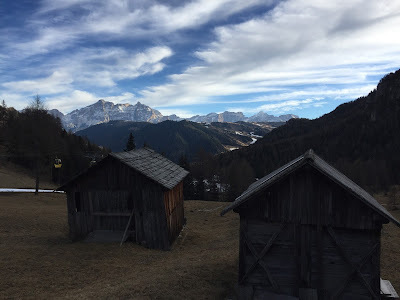 The second day we did the Sellaronda route. 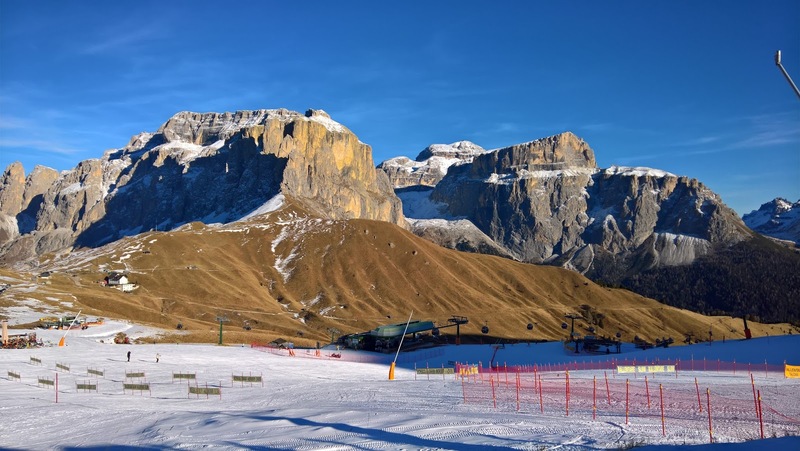 The Sellaronda ski route that takes you around the Sella mountain range, a plateau-shaped massif that is surrounded by four valleys: Val Badia (where we stayed), Val Gardena, Fassa Valley, and Val de Fodom. The route can be done clockwise (orange route) or counterclockwise (green route), and it can be done easily in one day. 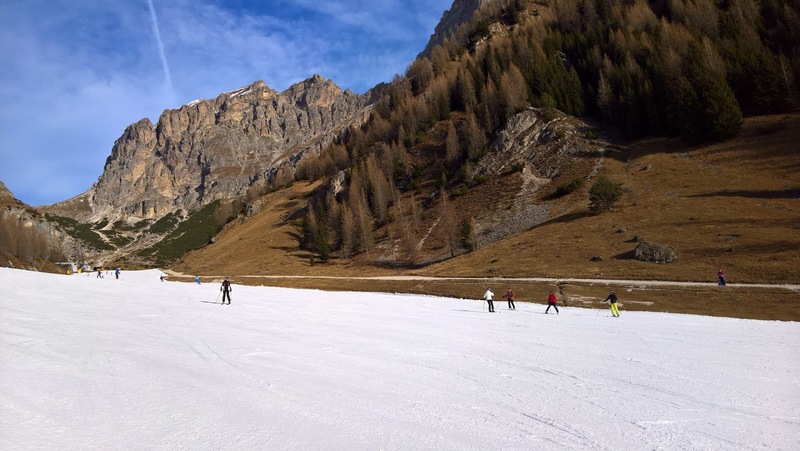 We are average skiers, and we found it relatively easy to do in terms of difficulty of slopes. We skied mostly blue (easy) and red (medium). 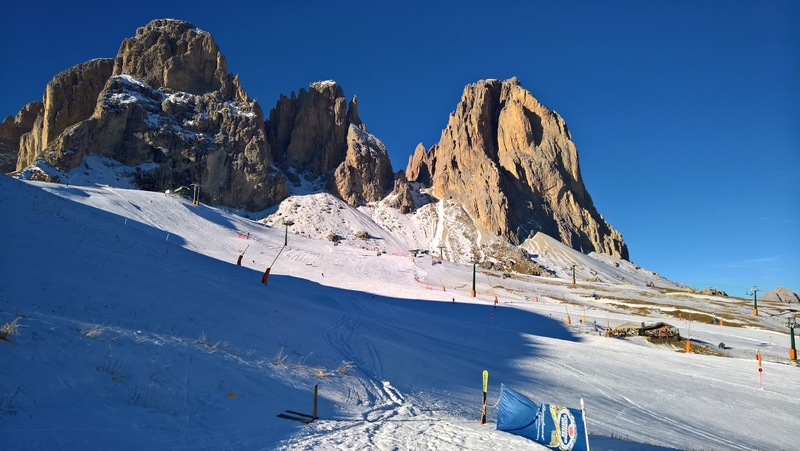 According the Sellaronda.info site, the orange route we skied is about 37 km in length with 13.5 km covered by lifts and 23 km skied. We did a bit more because a few points we did some runs that weren’t part of the Sellaronda circuit. The green route has similar distances. We got on the slope at 8:45 am and got off at 4:30 pm with a long break for lunch and the extra runs. Altitude-wise, we were between 5,000 and 8,000 feet. We rented our skies at Pescosta in Colfosco. For two people, renting everything cost about € 140 for 2 days. Finally, note the brown in the photos. There wasn't much snow outside of the man-made snow. While skiing, we had snacks and lunch at various rifugi along the way and were never disappointed. We still are the can’t-believe-it-phase that you can ski in these wonderful areas and have good food to boot. Pinch us. When not on the slopes we ate breakfasts at the hotel and then ventured out twice for dinner. The most spectacular dinner we had was eating again at Maso Runch, truly worth it for sampling Ladin cuisine. See the 2008 post Maso Runch - Hof, Pedraces for photos. The menu is fixed, and they just keep bringing the dishes. 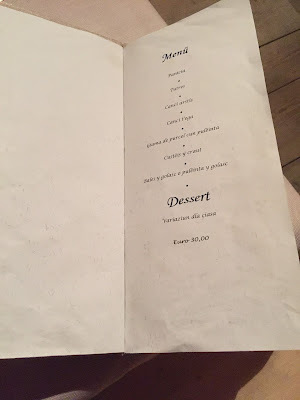 Here’s the order we had: panicia (an orzo soup), tutres (fried pasta, stuffed with spinach, ricotta or sauerkraut), canci arstis (leavened and fried ravioli with spinach or poppy seeds), canci t’ega (ravioli with spinach with melted butter), giama de purcel cun pulëinta (pork shank), custëis e kraut (pork ribs with sauerkraut), and Bales y golasc o pulëinta y golasc (goulash). Our second dinner was at Nature Delta Hotel (simple and good). Our third dinner was at Ristorante L’Fanà Grill Room, which specializes in grilled meat. 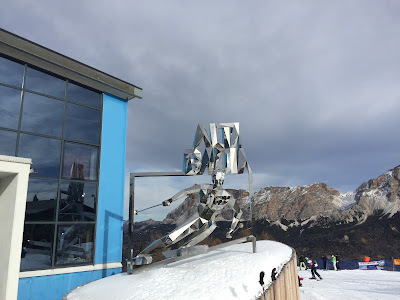 Left: Metal ski sculpture of Alta Badia. 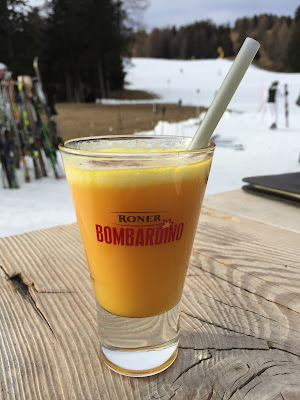 Right: The drink de rigueur, Bombardino. Left: Canci arstis at Maso Runch. Right: Menu at Maso Runch. 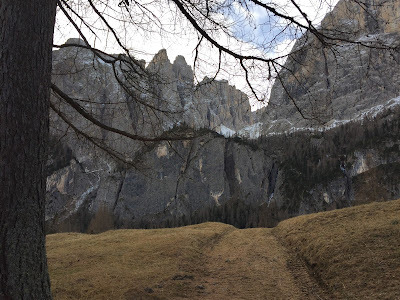 Left: Day 1 sky routes around Colfosco and Corvara. "Colfosch" is Colfosco in the Ladin Language. 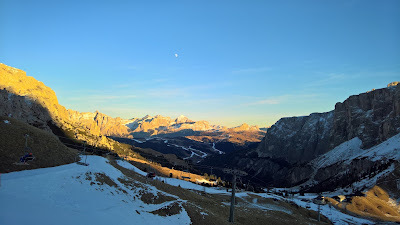 Right: Pass for Alta Badia and pass for the Sellaronda route (Dolomiti Superski). Left: Morning view from Nature Hotel Delta southeast. Right: Map of Sellaronda ski route. Orange clockwise. Green counterclockwise. 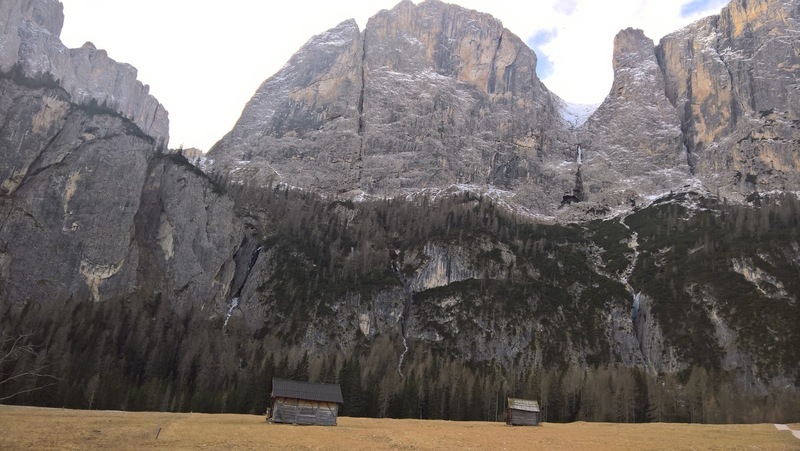 Slopes above Colfosco, Stella Alpina and Forcelles. Left: Last leg of Sellaronda route for us, dropping down from Val Gardena into Colfosco. 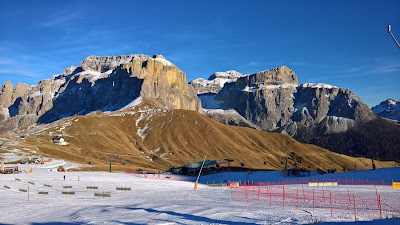 Right: View of Sella Group from Passo Sella, Canazei. Left: Those curious wooden barns typical of the Alta Badia and Dolomites. Center and Right: Views toward Val de Mezdi.